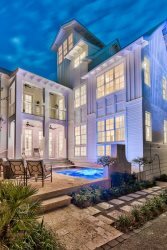 275 Lifeguard Loop is a Luxury Seacrest Beach House with Close Access to shops and restaurants in Seacrest Beach, Alys Beach, Rosemary Beach and Inlet Beach. 275 Lifeguard Loop is a Luxury Seacrest Beach House with Close Access to shops and restaurants. 30A Escapes presents... "275 Lifeguard Loop", a Seacrest Luxury Home! Avoid the hassle of loading up the vehicle every time you and your family want to see the sights and slip away to a brand new centrally located home in the heart of the Seacrest Beach Village. With five bedrooms, an additional bunk room and 4 baths, this luxurious new build has enough room to accommodate 16 people for a week of fun in the sun. From the home, guests only need to travel two minutes or less to the shops, sights and sounds circling around Peddlers Pavilion near the home. From the back of the home it takes less than one minute to reach Rosemary Beach and 30A. The five bikes that are provided complementary are sure to make navigating throughout Seacrest, Rosemary, and Alys Beaches a delight for everyone in your group. While staying at 275 Lifeguard Loop guests have access to two Seacrest Beach Village pools, one having a splash pad and zero entry point, the other being heated during the winter months. Both are a mere 30-40 seconds from the home. Gas grills are provided next to the pools for those who enjoy cooking out on warm summer evenings. Off street parking is located at the home for two vehicles with additional parking around the circle. A beach tram service is provided complimentary expediting your trip to the beach and back to the property afterwards. Entering through the side door of the home, You'll find that the freshly crafted hardwood floors and brand new homey Decor create a welcoming atmosphere for an excellent start to a great vacation. In the entry room there is a set of full over full bunks and flatscreen TV. Opposite of the bunks you'll find the staircase winding up to the second floor. The door to the right of the staircase contains just one of the homes well equipped features, the elevator; moving from floor to floor with ease. The first bedroom is also located on the first floor containing two queen sized beds, a nice sized walk in closet and a private full bathroom with tub. Coming off the staircase to the second floor, the open and airy concept living and dining room offer plenty of space for the whole family to socialize and gather together to relax. The kitchen appliances are brand new and top of the line, perfect for seafood and steak dinners. While relaxing in the living area and watching the large flat screen tv, open up the balcony doors on either side of the home and enjoy a glass of wine in the cool ocean breeze. Off the kitchen there is a bunk room containing a set of twin over twin bunks, a large flat screen television and another full bath with walk in shower. For those lodging in the upstairs bedrooms, worry not with carrying luggage up all three floors and ride the elevator for added ease during your time of vacation. On the third floor there are three bedrooms all containing king size beds and flat screen Tvs. The master suite you'll find at the east end of the home with a luxurious en suite bathroom equipped with double vanities, an enclosed shower, a deep soaking tub and a separated water closet. The bathroom in the hallway on the third floor is shared by the remaining two bedrooms but has plenty of room to accommodate with double vanities and a nice sized soaking tub. So why stay blocks from the beach in an older beach house when you could spend your week in a brand new luxurious home only steps away from all the action and amenities Seacrest Beach has to offer? The house/condo at Seacrest was gorgeous~ Towels galore Incredibly comfy mattresses and fancy appliances! Cannot wait to come back!